"Both sides vehemently denounce the reprinting of the offensive cartoon and the attack on Islam and its prophet," officials from both religious bodies said in a statement seen by IslamOnline.net. Concluding a two-day meeting of their joint interfaith committee in Cairo, the two sides also denounced any insult to any religion. Seventeen Danish newspapers reprinted on Wednesday, February 13, a drawing of a man described as Prophet Muhammad with a ticking bomb in his turban. The move came following the arrest of two Tunisians and a Dane of Moroccan origin for allegedly plotting to kill the cartoonist who had drew the caricature in 2005. "We call for the respect of faiths, religious holy books and religious symbols," read the statement. The two sides urged Muslim and Christian religious leaders, intellectuals and educators to instill such respect in society. "Freedom of expression should not become a pretext to insult religions and defaming religious sanctities." The Vatican's position makes no sense to me. 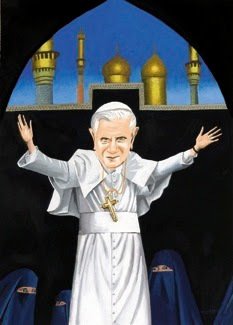 It is leading to a complete Dhimmi and roll-over attitude similar to the Head of the Church of England: - The Most Reverend Dhimmi Supreme Arcishop Himself - even though he now tries to retract his earlier statements on his recommendation to introduce Sharia in the UK. And by the way: al-Azhar is a university practicing institutional apartheid. The institution is banned for Jews and Copts, not only the department of theology, but also medicine, economics and agriculture. 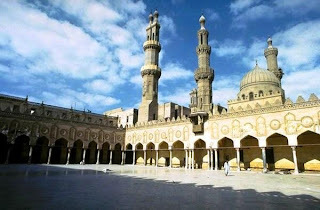 And speaking about offending religious sensibilities: al-Azhar has shown no willingness to abandon the part of the sharia providing Muslims with the obligation to insult non-Muslims’ religious feelings, while at the same time insisting that non-Muslims offending Muslims’ religious sensibilities should be punished. I call the Vatican a bunch of Dhimmies. Now is the time to fight back - or do you want Sudanese conditions all over the world? The War on Terror has ended?